People do lie. Many in fact do which may and will include you and me as well. Lies when told where it seldom mean to hurt someone as an individual or a group could be overlooked as an archaic but when the same is told with an idea to indignant feelings or worse even chump people, there where the lie need to be dealt with iron fist. When lies fly around with an agenda for gain, it calls for an immediate rebuttal by facts. There is a new cult of liars those have emerged post 2002 Gujarat riots. Time and again people with some sense of judgment have confuted many such liars and exposed the real motive behind any such hara-kiri. Time and again the liars, backed by a strong sagacity of personal gain stood exposed before the nation. Time and again the lies were mascaraed by raw and unapologetic truth, so much so that the liars were left with no option but to tuck their tails between their legs and run for cover. But has this immobilized the liars from lying again? I guess not. One of many such liars is a certain Dilip D’Souza. He is a so called new generation columnist for whom, the whole idea of journalism is to come up with half cooked stories, which could be aspersive to Narendra Modi. I don’t blame D’Souza entirely for such systematic storytelling as it has become a new trend for many to bark about Modi as the very act is a potential money spinner. His true credentials could easily be ascertained by his association with complete secular organizations like ‘Pakistan-India People's Forum for Peace and Democracy’, ‘Outlook’, ‘Mid-Day’, ‘Rediff’ and yes ‘The Hindustan Times’, where a very nice bundle of hypocrisy criticizing Narendra Modi yet again featured as a staple diet for a lot of Modi haters. So his monumental affection for lies, specifically when dealing with NaMo is anything but expected. As I said in my preparatory line that when lies take shape of an agenda, it calls for immediate rebuttal with facts. And I am here again for this specific job, to ridicule what Mr. D’Souza wrote about Modi on the context of Wharton’s so called snubbing. The excerpts are in red. The insult, first. I accept that Narendra Modi feels injured by Wharton’s action. After all, how many of us get the chance to address some of the brightest business students in the world? Modi must have been looking forward to that. No doubt it came as a slap in his face that Wharton was persuaded to take back its invitation. Insult? Seriously? D’Souza must be having some high grade of discernment to even grasp what Modi would be feeling. While he expediently praises the Wharton and its students, he forgets about the man who is part of the context. The caliber of a man to win elections three times in a row and that too after so much media predisposition, stands nothing as a credential for D’Souza. The man who single handedly proved even politics can deliver when no-nonsense guys lead has got no salutation from the writer. All that the writer sees is an opportunity lost for Modi to come out of the virtual shadow of Gujarat 2002 riots that few scumbags are webbing around for last one decade. I don’t understand how it can’t be a golden opportunity lost for the so called bright students to have a direct chat with a person whom Time magazine has declared as a man to watch out for. Why it can’t be that the students have lost a chance to interact with a man who means business, which is so unlike to our otherwise corrupt, incompetent and lazy politicians? And when he says Modi was looking forward to it as if his whole career was dependent on the keynote, he forgets that it is the Wharton that invited Modi suo motto. Modi never urged the organizers to have him on the panel. Though the facts remain as fractured as it can be for Dilip, to go ahead and call it a slap is little out of tune to say the least. If D’Souza is so serious to learn the definition of a slap, he need to look at the election results of UP, Bengal and even Gujarat and see the cheeks where the slaps landed. Though I realise Modi has long learned the value of labeling criticism of him as insults to Gujarat’s “Asmita”. For a decade we’ve seen him do it to any questions about the massacres of 2002, reaping the electoral rewards such rhetoric is designed for. Now that he nurses wider political dreams, the labeling gets correspondingly wider too: it’s not just Gujarat, but, as the Shiv Sena’s Suresh Prabhu announced, “Wharton has insulted India.” Look, Mr Prabhu, I’m Indian and I’m not insulted. Please don’t presume to speak for me. Lies again Mr. D’Souza. If you care to rewind back the events and insincerities that were floundered after 2002 riots, you will see, it is not Modi who vexed to equate himself with Gujarat but the Congress did. How many times we have seen Congress politicians disagree to be on the dais just because Modi happens to be there? Had the objections been there for political events, it would still have made some sense but we have seen Congress stooges rushing out even when the function was all about Gujarat. 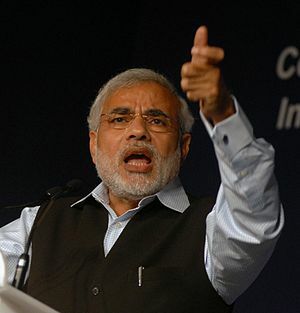 Now what has Modi’s presence got to do with Gujarat summit for potential investors? Let me brush your soiled memory a little more. Do you remember how Amitab Bachhan was apartheid out from all national events because he happens to be the brand ambassador of Gujarat tourism? Who is equating Modi’s stature with Gujariti community’s Asmita? And how naïve it is to say Modi’s elections wins in Gujarat are as a result of this particular rhetoric. So Modi's flawless governance and corruption free leadership has got nothing to do with his landslide wins, election after election? Lets clear this statured fragmentation Mr. D'Souza; had rhetoric been futile in Indian politics then I am sure Rahul Gandhi would have swept UP polls, because there we have seen much more rhetoric than the combined count that we have ever seen in our political history. And shouldn’t Mr. Prabhu be privy to his own thoughts? Unlike you D’Souza, there could be millions who would have felt humiliated by such caddish behavior of Wharton. It may very well turnout that we have more people who would be genuinely aggrieved by this than otherwise. So someone citing his voice of discontent shouldn’t be presumed, he is speaking on behalf of you, me or any other individual. That said, unless you are too bound by your hypocritical compulsions, then I don’t see any reason why you shouldn’t feel it as a personal insult when your own representative is humiliated such unceremoniously. This is so shaky an argument that it’s a wonder someone as erudite as Bhagat even tries to make it. For one thing, Wharton is a thoroughly private, independent institution that has nothing to do with its country’s government. For another, that country also makes friends with democracies. So? You may find it shaky, but I see logic here with what Chetan has to say. Any nation first consolidates its own interest. As long as a nation’s interest is gratified, many really don’t care if everything in the process is ethical to the last syllable. That’s why we have friendly relationship with Iran and UAE, where we see people being routinely beheaded in public. A great act of protecting human rights, I must say. I would ask all such human rights watchdogs like you to elaborate the reasons behind selective blindness in the whole theory of human rights violation nonsense. Though none, including our Apex court finds any evidence against Modi, you guys hold him the biggest human rights violator after Hitler but fail to see the same when Manmohan Singh goes on for a hugging and kissing spree with Ahmadinejad. Hope you have heard of an organization called Amnesty International and what they have to say about the filthy Iran regime. If our seriousness is to only party with individuals who can even shame Dettol then we must conjure our behavior when around people like Ahmadinejad. Now when you say USA also cajoles with various democracies, it is not out of sheer love either way but because there where that nation’s interest lies. Pity, you being such an astute of humanity just don’t understand these basics of diplomacy. And for records, Wharton didn’t called Modi for his human rights records but because he is a man of values, credentials and vision. And finally, freedom of expression. The extent to which this straightforward concept is misunderstood always mystifies me. What it means is, I’m free to express myself, just as you are and just as Modi is. But let’s understand: so are those who don’t want to hear Modi. Here’s the absolute essence of free expression: views we find annoying or offensive enjoy just the same freedoms our own views do. Presumably there were people who wanted to hear Modi, and they asked the Wharton organisers to invite him. In just the same way, there were people who didn’t want to hear him, and they asked the Wharton organisers to withdraw the invitation. Freedom of expression applies equally to both those groups. Simple logic Dilip, there could even be many who just don’t want Manmohan Singh to be there where he is now anymore. But does that calls for ouster of Dr. Singh? No and why is that so? Because it is a democracy and majority or so as it is been touted as, want Dr. Singh to govern. Same lies with those who don’t want to listen to Modi. Could you for once authenticate if the number that was against Modi’s keynote was higher than those who wanted to? If prejudice hasn’t yet blurred your visions Mr. D’Souza, please go through the list that opposed Modi first. Or for that matter the entire list that have signed that petition or some nonsense to that effect. Not even one of them is a sitting professor at the Wharton school of business. The entire congregation is from different colleges of Pennsylvania university with the individuals in the lead role have disputable association with GOI of the day. Why in the name of Neptune you just don’t accept that the pseudo secularism bug has bitten the left liberal morons in our Indian congregation there to stage such an abstentious propaganda of bloody secularism? And as for the freedom of expression defined in the first amendment and the subsequent screwing up of the same in Wharton goes, you need to speak to individuals on the street than sitting inside the comfort of your A/C room and trying to be street smart. For many, the whole farce is nothing but a clever by half approach of Wharton to hide, how they were bullied by the religious Islamic thugs and their protagonists to bunkum the standpoint of their nation’s constitution on its head. If the concerns of Modi’s track record as a human rights violator are so serious, then students along with the left liberal thugs should have been allowed to ask direct questions and sought to the point answers; that too straight from the horse’s mouth. To deny someone a chance to clarify his own stand, just because you have a skewed perception of that person is not only undemocratic but whole lot criminal. You possibly can’t form your opinion on biased television reports so much so that you held someone culprit even without giving him a chance to explain. Can you? As surreal as it may not look Mr. D’Souza but more than genuinity, it was whole lot political when a bunch of rascals, clothed as professors started to hamper the unabridged idea of sensible thinking. Dilemma was not there with Wharton but with the scamps who actually don’t understand the whole notion of democracy and free speech. Wharton was just the causality in the tussle and bullied badly to tow the lines of these rogues. Now I feel pity on all those students on the kind of education these self-serving morons would be imparting. excellent, These self styled morons converts justify that their ancestors have defective genes who converted and produced such useless fellows to eat away india. Brave Hindus were courageous long back, Now become cowards due to selfishness and corruption. Look at those morons sitting behind any govt desk, they sell the soul to feed sht to their family. As Ravinar rightly said in his blog, let these anti-nationals rejoice for now. Come 2014 and we will have the last laugh. WHEN TIME MAGAZINE CRITICIZED MANMOHAN, IT WAS SUPPOSED TO BE AGAINST INDIAN DEMOCRACY !!!!! IN 2011 TAMILNADU POLLS, DMK RAINED LAVISH GIFTS OF MONEY TO WOO VOTERS WHO WERE DISGUSTED WITH CRIME AND CORRUPTION. VOTERS ACCEPTED ALL MONEY, BUT VOTED AGAINST DMK. IN 2012 UP POLLS, RAHUL PROMISED SPECIAL QUOTA FOR MULSIMS. MULSIMS SMILED AND VOTED AGAINST CONGRESS. DIRECT CASH TRANSFER WILL ALSO END UP LIKE THAT. I have been following Dilip D'Souza for over a decade. Here is the funny part about him, he virtually disappears when there is Congress government at the center. He then, magically reappears as a benign avataar about a year or 2 before the Congress Government is about to fall or appears ready to fall.His primary job is filling newspapers with his half baked theories and lies about congress sucesses and remind people about BJP failures and extremism trying to prevent the opposition government (read BJP ) from making significant gains. When all that fails and BJP is swept into power he is ready in his new avataar as the opposition in chief digging all the party's small mistakes, taking about Staines etc and trying to pin BJP down, only to disappear again when Congress reappears. This is Dilip D'souza the hired gun in a nutshell for you. i have been reading your blog since the last few weeks and i am really impressed by the content and the language used to express our collective anguish against this nexus of pseudos and anti-nationals. for long i have tolerated this B.S of blogs by media men and pseudos. this is something that voices our opinions. i would like you to check out another such website. Modi has given a new definition of secularism which is much needed for the rise of today's Bharat. Look how afraid are those who believes in "divide and rule" policy only for their selfish means Dying to hear "MERE 125 crore Bharatiyo" from our favourite Modiji.